TIJUANA, Mexico (CNS) — These days, Sister Adelia Contini sees more Mexicans fleeing north toward the U.S. than she does families from Honduras, El Salvador and other violence-plagued regions of Central America. “We’re seeing a lot of people from Michoacan and Guerrero,” said Sister Contini, 70, director of Instituto Madre Assunta, a shelter for migrant women and children in Tijuana in the Mexican state of Baja California. It is operated by the Missionary Sisters of St. Charles Borromeo, or Scalabrinians. The institute, established in Tijuana in 1994, sees about 120 women a month, many of them single mothers with one to three children, Sister Contini said. It offers assistance to women and children displaced by deportation from the United States or who are migrating north from Mexico. The institute provides three meals per day, clothes, shoes, legal assistance, psychological care and access to phones and medical assistance. She attributed her interest in migrants from her studies of Catholic teachings that emphasized the needs of the very poor. She said the situation facing migrants grows more dire with each passing year as they attempt to flee Mexico for work and security in the U.S.
Last year, the International Institute for Strategic Studies published a survey on armed conflict that put Mexico in third place after Syria and Iraq when it came to fatalities. Researchers estimated about 100,000 people have been killed in Mexico in the past decade. High levels of crime accompanied by even higher levels of violence have resulted in part from drug traffickers competing for control of the market. Confrontations with law enforcement operations against the traffickers heighten the violence in a never-ending cycle of face-offs and skirmishes, especially in the cities of Tijuana and Ciudad Juarez, and states of Durango, Sinaloa, Guerrero, Chihuahua, Michoacan, Tamaulipas and Nuevo Leon. Last July in Iguala, Guerrero, 43 student teachers disappeared. Criminal gangs, along with some corrupt police officers, are thought to be behind their disappearance. Police forces struggle to keep organized crime groups and local gangs from preying on residents and threatening the employees of major multinationals with operations there, including the Coca-Cola Co. and PepsiCo. In January, the Mexican daily La Jornada reported that authorities recorded 324 homicides in Guerrero between October and December 2015 and accused drug cartels of being responsible for the murders. “In Guerrero, families are being run out of their homes by violence and poor jobs,” said Sister Annette Tonial, 74, one of three sisters who work at the Instituto Madre Assunta alongside lay staff and volunteers. She said the work of the institute will never end until Mexicans find sustainable employment in their own country. In February, Maria Guadalupe traveled to the Institute Madre Assunta from her home in Istapas Guatanejo, Guerrero, with her 2-year-old son, Umberto. She left Guerrero in part, she said, because her cousin was murdered — shot in the head. Police suggested robbery as the motive. But her cousin waited tables in a bar and worked around a lot of married men. Rumors spread that jealousy was the true motive. Whatever the reason, her death scared Guadalupe and her husband. Afraid to live by themselves, they moved in with his family. But the living arrangement with her husband’s family proved unworkable, she said. Her mother-in-law also had little patience for Umberto and would slap him when he made her angry. Guadalupe told her husband she wanted to leave. Friends suggested she seek asylum in the U.S. Her husband agreed. He told her it would be easier for her to cross into the U.S. as a single mother. He planned to follow her once her asylum application was approved and meet her and Umberto in America. Guadalupe and Umberto took a bus Feb. 18 to Tijuana’s border with San Ysidro, California; she turned herself in to U.S. border agents there. After four days of detention, she said, the agents denied her asylum request because she was not a specific target of gangs. Although the institute serves only women and children, the sisters provide lunch for homeless men, many of whom also had left troubled areas of Mexico for what they hoped would be a new start in the U.S. For some, deportation put an end to those dreams. 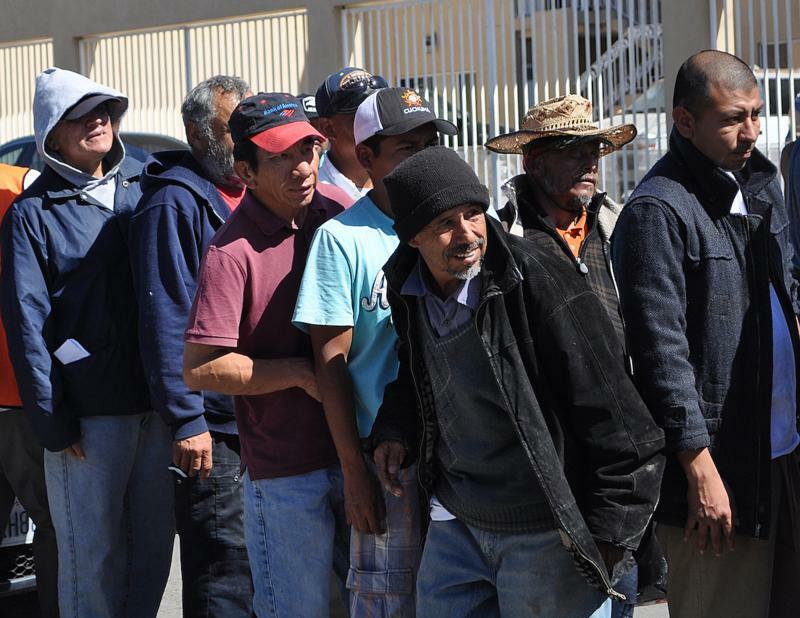 According to the National Statistics Institute, 49.5 million Mexicans had a job in 2014. The minimum salary is 70.1 pesos, less than U.S. $5 per day. Many Mexicans deported from the United States, such as Heber Marin Velasquez, 28, from Vera Cruz, earned twice that per hour when they lived in the U.S. Velasquez worked as a landscaper in Riverside, California. “I wanted to go to the U.S. because it was the land of opportunity as people say,” he said as he stood in the food line outside Instituto Madre Assunta. He’d lived in California since 2005 but was deported in February after being arrested for speeding. Now, back in Mexico, he intended to return to Vera Cruz rather than attempt to enter the U.S. again. He had no desire to live in Tijuana. Last year, the border city saw more than 100 murders between April 1 and May 31. Authorities attributed the murders to the city’s street drug trade. Instituto Madre Assunta client Cecilia Luengas Hernandez, 19, also has decided to stay in Mexico after she failed to enter the U.S. last year. Like so many before her, she left Guerrero to escape the violence. The kidnappings and robberies frightened her. The disappeared student teachers only increased her fears. She was afraid to leave her house. Her friends stopped attending school. Shortly before she left, someone mugged her aunt and uncle. Hernandez, her 20-year-old sister and 13-year-old cousin requested asylum at the Tijuana-San Ysidro border Dec. 26. Hernandez said agents separated them. She asked to be released after three days. She did not like being alone in a small room with only a mat on the floor and wanted to return to Mexico. As she left her holding cell, Hernandez said she saw her sister’s backpack. She assumed the presence of the backpack meant agents still held her sister and cousin. The U.S. agents would not tell her, she said. She has yet to learn what happened to her sister and cousin. The agents asked her if she felt safe returning to Mexico. She said she felt safe crossing back into Tijuana. She thinks now that by leaving, she may have waived her rights to a future asylum request. A Mexican police officer brought her to Instituto Madre Assunta. Sister Contini said she often hears that question. She has no answers. She hears such tragic stories. Every day, she prays for strength to do her work. Copyright ©2016 Catholic News Service / U.S. Conference of Catholic Bishops. ©2016 The Leaven Catholic Newspaper. All Rights Reserved.